Stunning pre Civil War map of South Carolina. A New Map of South Carolina with its Canals, Roads & Distances from place to place along the stage & steam boat routes. 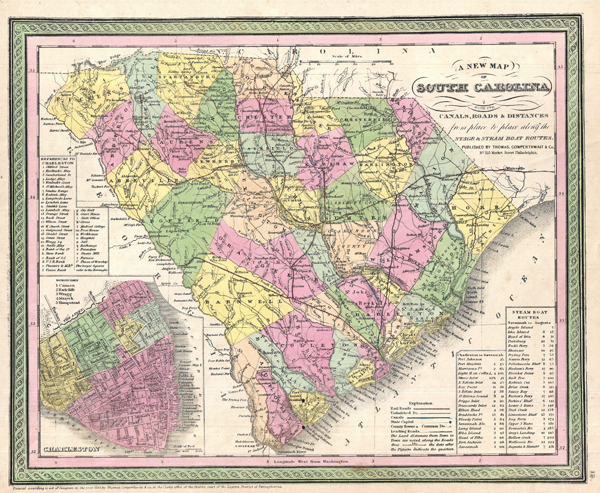 A fine example of Samuel Augustus MitchellÂ's important 1850 map of South Carolina. This map shows cities, topographical features, railways, ferries and roads with color coding at the county level. In addition to cartographic information this map is full of practical data for the traveler including notes on steam boat and ferry routes. The lower left quadrant bears a detailed inset of Charleston divided into its five goroughs: Cannon, Radcliffe, Wragg, Mazyck, and Hampstead. Important buildings, streets, wharves, and piers are also noted. Very good near pristine condition. Blank on verso. Rumsey 0537.020. Phillips (Atlases) 6103-19.